The goal of this project is to create the appearance of realistic human characters. This task can be broken down into many subproblems: animation, body shape, surface appearance, etc. So far, most of our work has focused on the body shape subproblem; specifically, how to use data from 3D scanners to create models of human body shape. As the body moves, its shape changes in complex ways, due to the contraction and relaxation of muscles, bones visible beneath the skin, and various other anatomical features. Often this variation is modelled either by artists using various varieties of deformers, or by anatomical modeling and simulation of the bodily structures involved. Instead, we take an example-based approach, where we build a model of these shape changes using 3D laser range scans of a body in various poses. We scanned an arm, shoulder, and torso in many different poses, a few of which are shown on the left. We then combined these scans into a common parameterization, so that the shape of the body in any pose can be estimated using scattered data interpolation techniques. The details of our parameterization and interpolation techniques are described in our SIGGRAPH 2002 paper. More significantly, our common parameterization also enables us to analyze the variation in body shape, using techniques such as principle component analysis. One possible application is to use the learned distribution of shapes to synthesize new, random individuals. In the figure above, the individuals outlined in red were randomly generated. The details of our correspondence algorithm and applications are in our SIGGRAPH 2003 paper. ALLEN, B., CURLESS, B., POPOVIĆ, Z., and HERTZMANN, A. 2006. Learning a correlated model of identity and pose-dependent body shape variation for real-time synthesis. In Proc. of the 2006 ACM SIGGRAPH/Eurographics symposium on Computer animation, p. 147-156, Sept. 2-4, Vienna, Austria. ALLEN, B., CURLESS, B., and POPOVIĆ, Z. 2004. Exploring the space of human body shapes: data-driven synthesis under anthropometric control. In Proc. 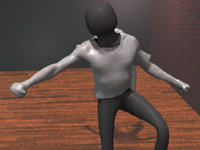 Digital Human Modeling for Design and Engineering Conference, Rochester, MI, June 15-17. SAE International. ALLEN, B., CURLESS, B., and POPOVIĆ, Z. 2003. 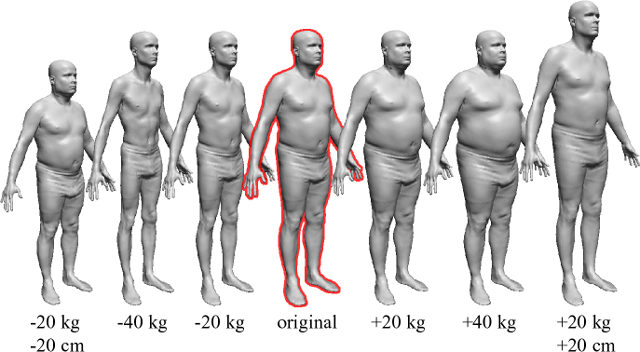 The space of all body shapes: reconstruction and parameterization from range scans. ACM Transactions on Graphics (ACM SIGGRAPH 2003), 22, 3, 587-594. ALLEN, B., CURLESS, B., and POPOVIĆ, Z. 2002. Articulated body defromation from range scan data. ACM Transactions on Graphics (ACM SIGGRAPH 2002), 21, 3, 612-619. 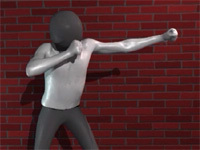 The arm dataset from our SIGGRAPH 2002 paper on pose pose variation is available online.